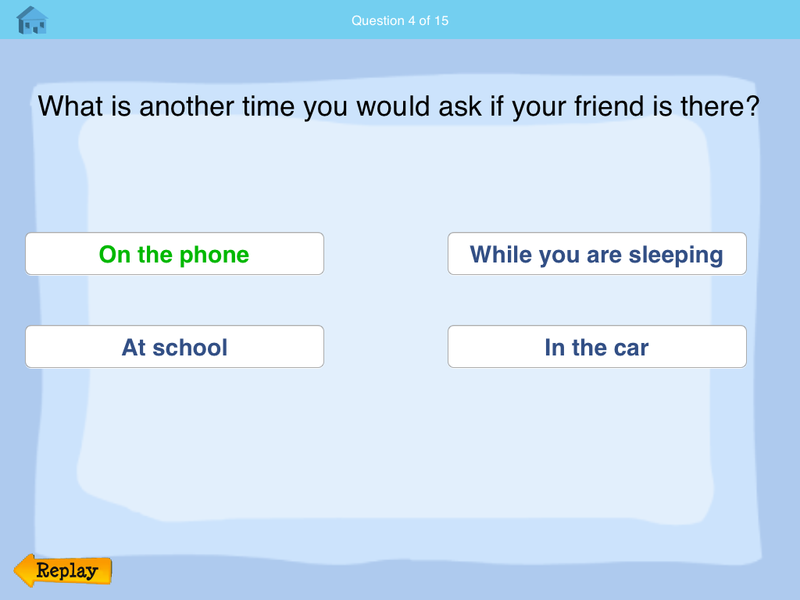 There is no doubt that iPad apps for social skills are highly sought out. The iPad offers the ability to capitalize on technology at our fingertips! Including videos of social situations seems like a wonderful use of the technology. When Social Skill Builders asked me to review their full app, I was excited to test out these videos with my caseload. Social Skill Builders first developed CD-Rom videos and questions. 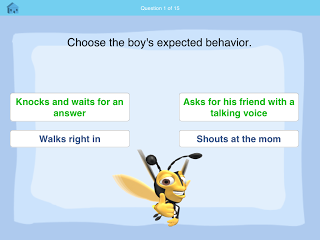 In their computer based programs, each program highlights video scenarios of real children interacting in social scenarios and then the user has the ability to choose what should be said or done next. Programs cater to a wide range of functioning and abilities. At Level 1, children learn key social vocabulary. 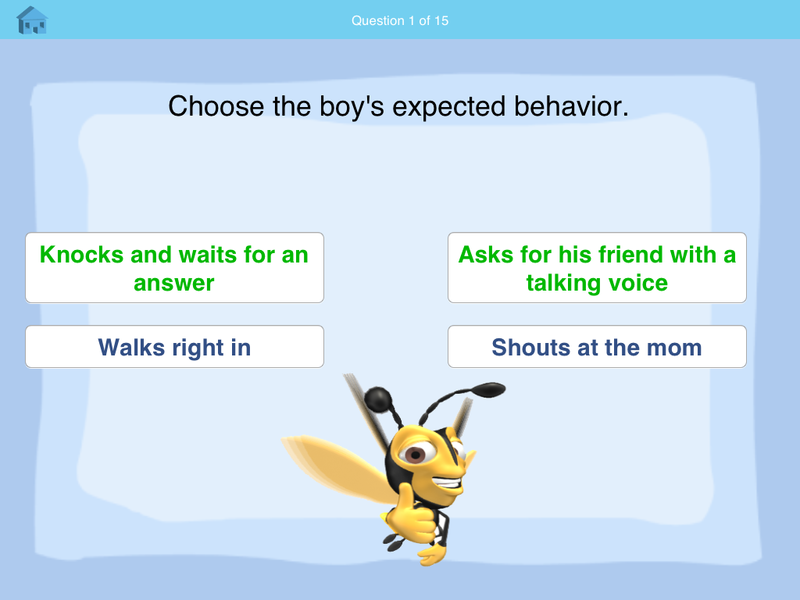 At Level 2, they answer multiple-choice questions, and at Level 3, they identify social cues. Level 4 allows children to create a novel social response based on the situation. 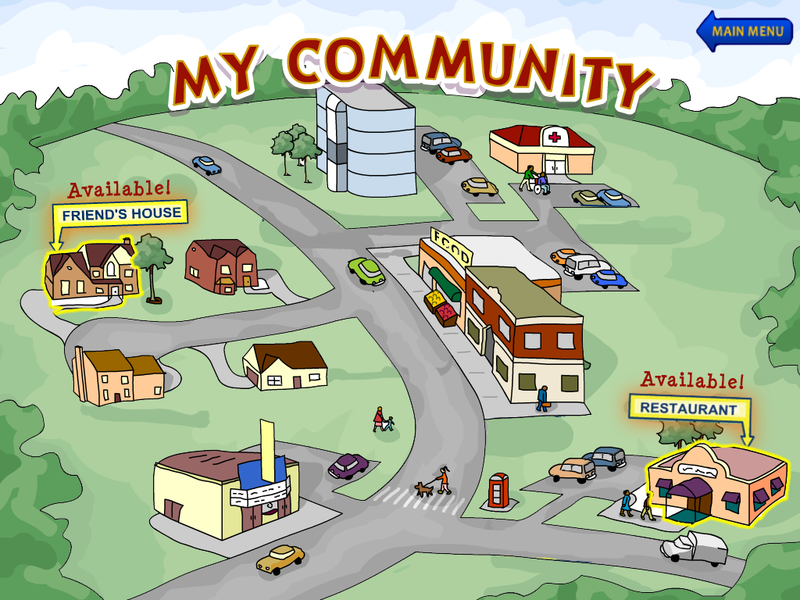 Additional levels in the My Community and School Rules! 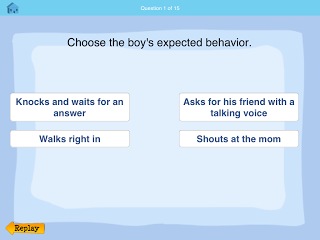 software allow children to compare and contrast and examine different aspects of Theory of Mind, which focuses on what others are thinking, feeling and perhaps going to say or do next The Social Skill Builder App is based on this program but with a more limited range of activities. The app features different modules for a variety of ages including preschool to high school. The full version includes: 2 modules in the title Preschool Playtime (Preschool & Playground) 6 modules in the title My School Day (Laughing, Table Talk, Classroom, Transition Time, Lunch Time & Jungle Gym) 2 modules in the title My Community (Friend’s House & Restaurant) 2 modules in the title School Rules! (Hanging Out & Classroom Assignments) The app works by playing a short video clip. Then the students are asked several questions about appropriate behavior, other’s perspectives, etc. The module continues with videos and then questions in the given situations. First select a setting. Press start. 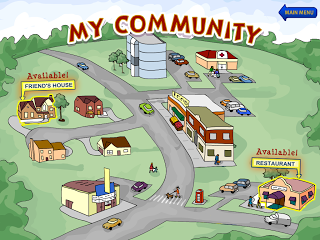 For example, click on the ‘My Community’ setting. One inside this setting, the app contains a module for ‘Friend’s House’ and ‘Restaurant’. Click on the video you choose to play. In this case we selected ‘Friend’s House’. The typical sequence in the apps includes a first module with appropriate behavior and then another example of atypical social behavior. Each module contains 10-15 questions. When answering questions you always have the option to go back the previous video for review. When the quiz is finished, the app shows the number of questions answered correctly. So overall with the purchase of the full app you’re getting 12 modules, each with about 5 short clips and 10-15 questions. Social Skill Builder reports that they will add other modules in time but that these will offered for additional purchase as ‘in-app’ purchases. If you are a therapist or school targeting many different age groups this ‘Full’ version with a wide range of ages is great. The app full app includes 12 different modules. If you work with a specific age group only, such as preschool, Social Skill Builders also offers a ‘Lite’ version for only $2.99. This includes one module from the 4 different settings listed above. Then you could purchase the other modules within that specific setting you need. So if you purchase the Lite version for $2.99 you would get one preschool module (and 3 module’s for older kids). You could pay $1.99 as an in-app purchase to get the other preschool module. Pros: The examples seem to contain real-life situations, such as sharing video games. The actors use speech typical of kids, like ‘dude, chill-out’. I really like that they vocabulary is consistent with Michelle Garcia Winner’s work (expected/unexpected behaviors). This creates consistency across my sessions. Some of the videos use less obvious unexpected behaviors. For example in one video a child invites himself to spend the night. Some of these more subtly inappropriate behaviors are the most difficult to teach, so I’m glad they’re included. Cons: I really hate apps with in-app purchases. If I am paying for the ‘full’ app, it should have the full program available! The app’s sound quality is sometimes poor. In some instances I had to play the videos twice in a classroom to hear them appropriately. The videos are not HD, and I find the quality of them fuzzy. After answering questions,there is a voice that gives praise like “You are so smart” accompanied by a small animal. This isn’t appropriate for the older kids and it’s included in modules for kids up to 15 years old. In the app, it offers the ability to add a student. That data is tracking during each module, but not stored for access within the app. The app also doesn’t allow for tracking of completed modules for those student’s added to the program. After using the app, I instantly wished there were more modules. Even though I work with a wide range of students, I didn’t get extended use out of it with any particular group of students. My bright kiddos could memorize these scenes so we used them once. I wish the app had more modules to use. My bottom line: The app contains a great start to using social videos to teacher social skills. I hope the developers will continue to expand the videos and You can try out the Lite version here! The Lite version is $2.99. The full app is priced at $14.99. Purchase it in the iTunes store. a Rafflecopter giveaway Disclosure: This app was provided for review. The opinions are mine. « Two! 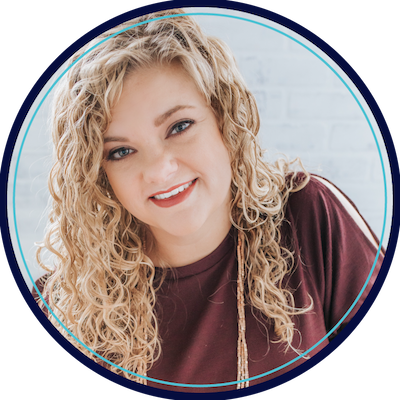 A Blogiversary Celebration! 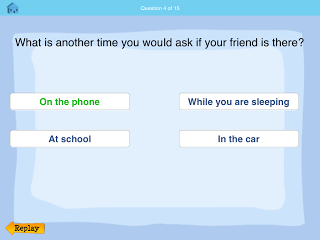 I have used the Lite version of the Social Skills Builder. I typically teach social skills in a variety of ways (depending on the needs of the clients I am working with). 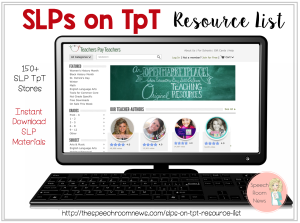 I would use this application in my social language groups and in my individual sessions. I would use this app with both groups and individual 1:1 sessions to help reinforce expected behaviors. I would use this in my social skills groups. I teach social skills via social stories, games,role playing snd apps. I’m teaching more and more children social skills. 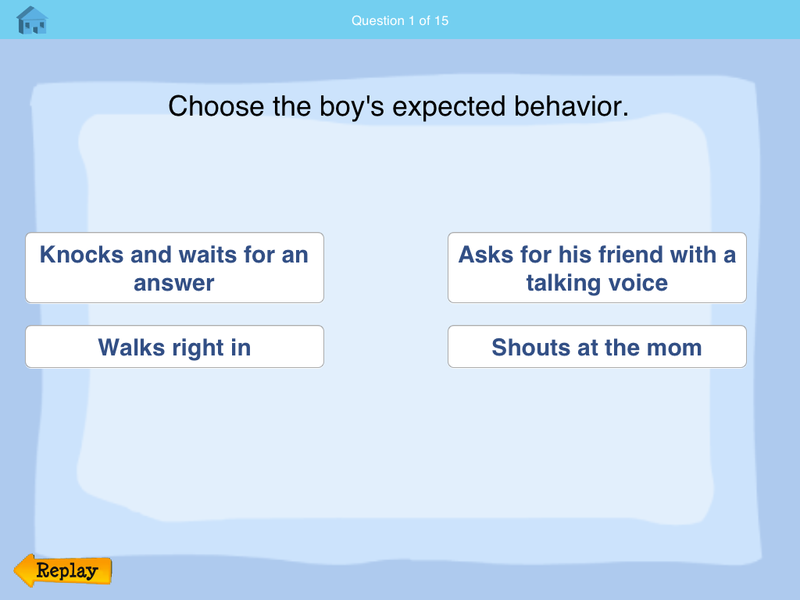 They love the ipad so I would use this app with my small groups to reinforce expected behaviors in school. I haven’t used this app. I often use wordless picture books to develop narratives. The majority of my case load has social skills deficits, so I know I could get a good bit of use out of this app! I’m getting more and more students on my caseload for social skills. This app looks like it would be very helpful. I work with older kids so anything that is good for them it worth it to me. I hate doing worksheets. I usually use real pictures to discuss social scenarios, but feel like my students would engage so much better watching the videos on this app. I try to use real life situations to target social skills. I believe these videos would really engage and motivate my kids social skills kids. They all love watching/doing anything on the ipad. They really pay attention and seem to get more out of the session when it involves apps on the ipad. Love this idea! Thanks for sharing and the giveaway opportunity! I try my best, but often feel time is a huge constraint. This app would be used almost daily. Love the actual pictures and comprehension a the end! I’ve used the videos included with the Lite versin of Social Skills Builder, and would love the full version. 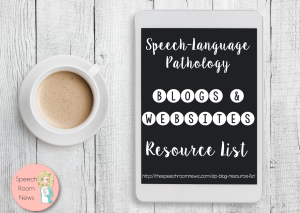 The school psychologist and I (I’m an SLP) co-lead social skills and pragmatics groups and this app is perfect for that.